The cupboard was bare, the fridge was an icy cavern bereft of succulent goodies, and the sun was shining. 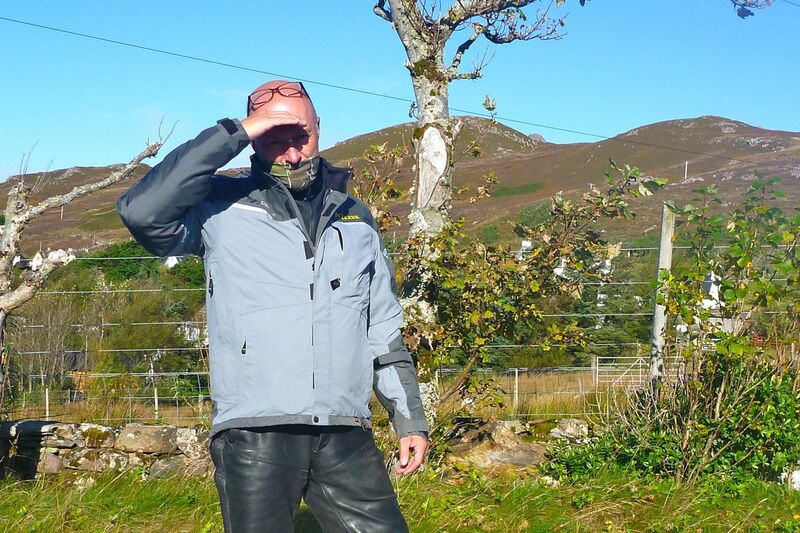 It was high time for a shopping run to Ullapool. 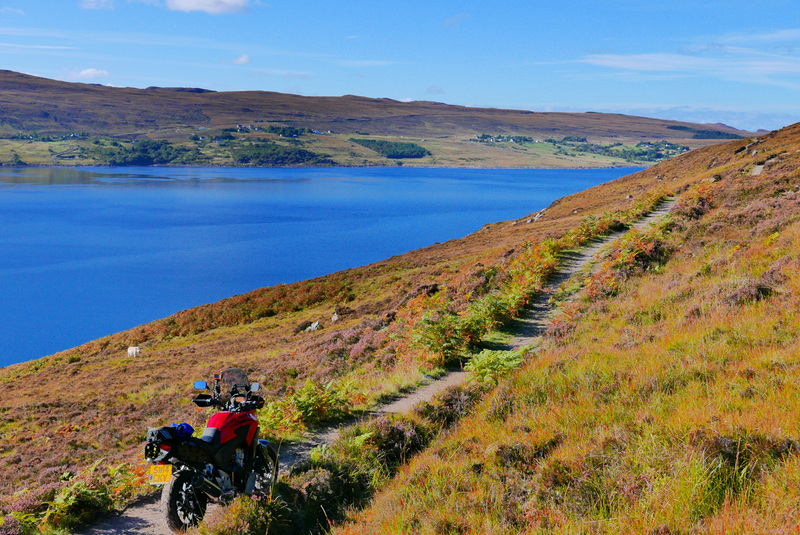 And, finding myself between chapters on the new AMH, it was also high time to saddle up the CB-X for a ride along the lochs and glens to try out some new gear. 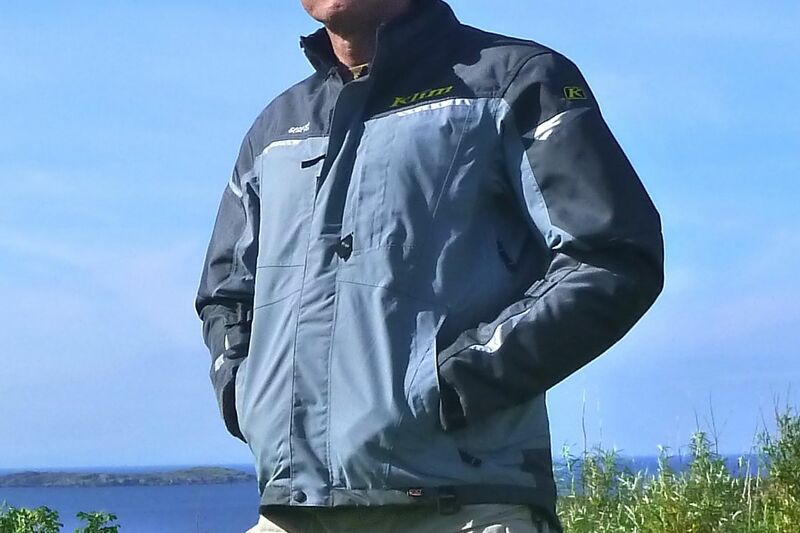 In need of a decent coat for a winter getting to and from the desert, Adventure Spec recently sent me a Powerlet Rapidfire heated jacket and Klim’s Overland jacket. AS had already sent me a Latitude to look at a couple of months back. But considering the investment in such a key item of gear, I found the Latitude either a little small in L, or way too big in XL. And in other ways it didn’t quite compare with an Aerostich Darien Light which I still consider a benchmark in travelling jackets. Wearing the Powerlet liner (about the bulk of a fleece), the Overland in Large felt tight across the chest and shoulders and yet, according to the chart on the right, I’m (42″ chest, 6’1″, 95kg) at the lower end of their Large range. The Overland was snug on me dressed in full gear – but still useable. If you’re taking your first steps into Adventure and Adventure Touring, the all new Overland series from KLIM® is a tremendous value [sic]. Good value, solidly built three-season shell that’s well-designed, has some tidy features and an understated look. 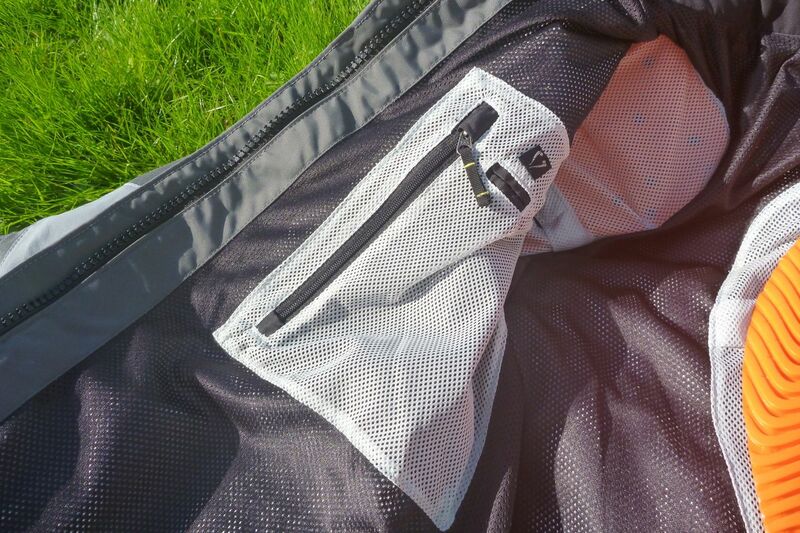 Warmer than you think too, but could use more- or just bigger pockets in and out. 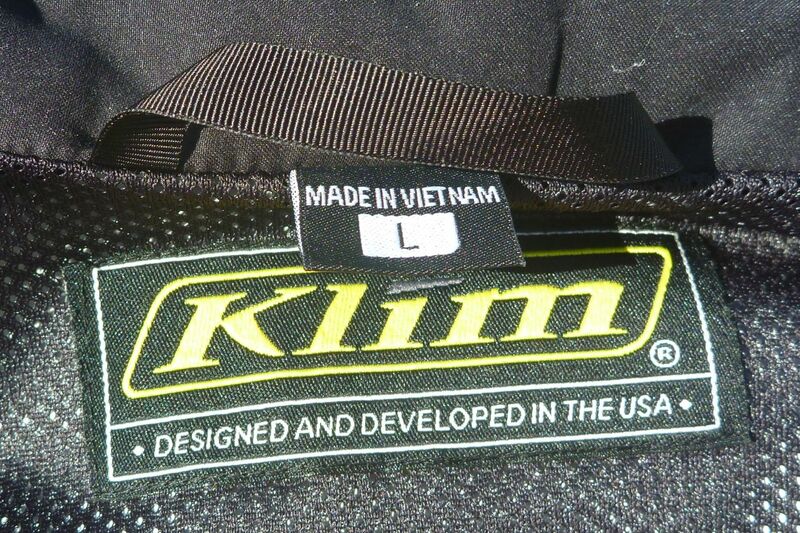 And beware: Klim sizing comes up small. • The cut is boxy and most of the arms and shoulders are over-layered with coarser and darker abrasion-resistant panels of 840D weight Cordura. 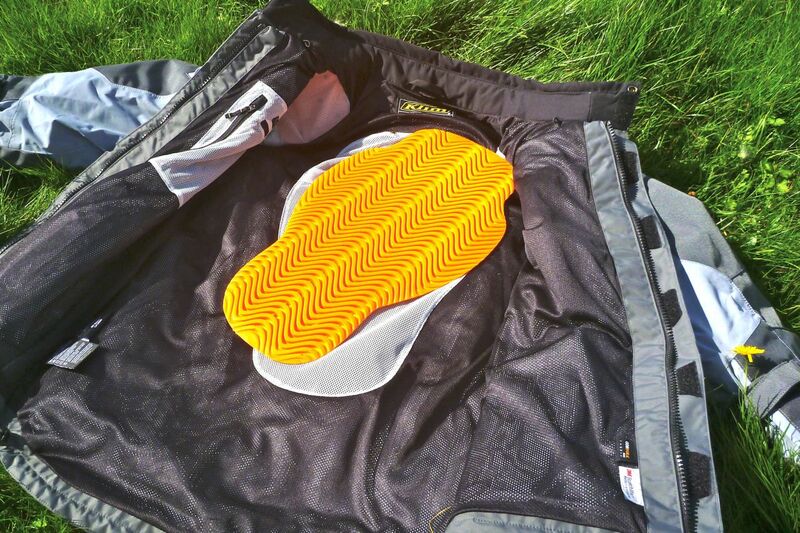 The light grey body is made of much less stiff regular nylon fabric of about half that weight. 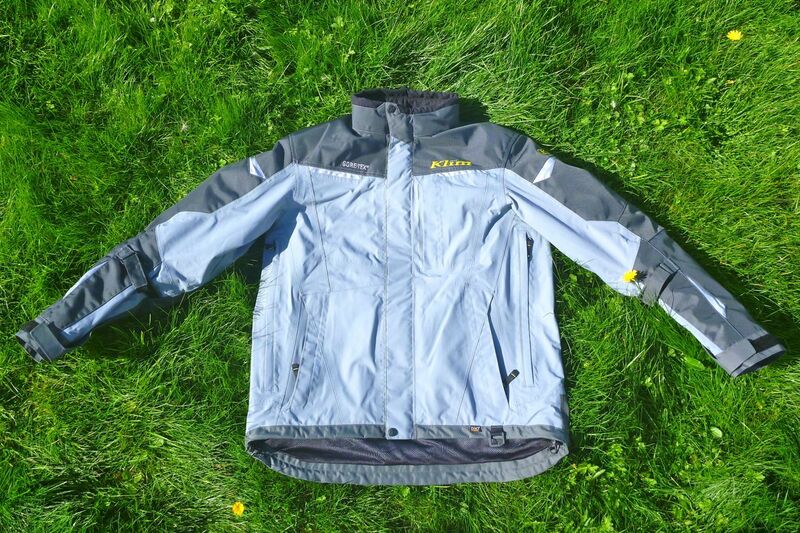 The mesh lining is polyester and the membrane is Gore-Tex tw0-layer Performance Shell which is ‘Guaranteed to keep you dry ®’ and the jacket has a lifetime warranty too. 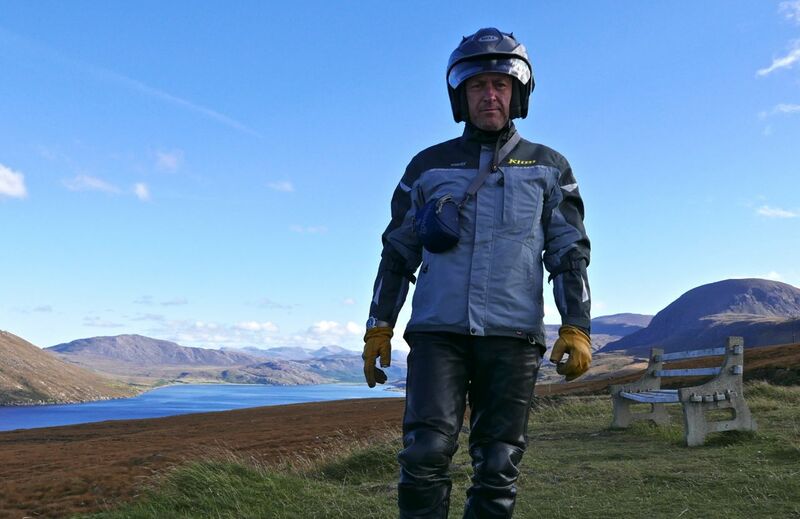 A few years ago when Klim first came to the UK, I remember looking at a Badlands or something at the Ace Cafe Adventure Day and thinking: £800 for a jacket – really? Of course Rukka had come to price themselves up there too, incorporating what I considered fussy, over-complicated ‘technical’ designs that seems to be a way of justifying high prices on a lot of stuff these days. But 800 quid for a garment made in Southeast Asia? Maybe ‘start high – bring in the cheaper stuff later’ is a recognised marketing strategy. 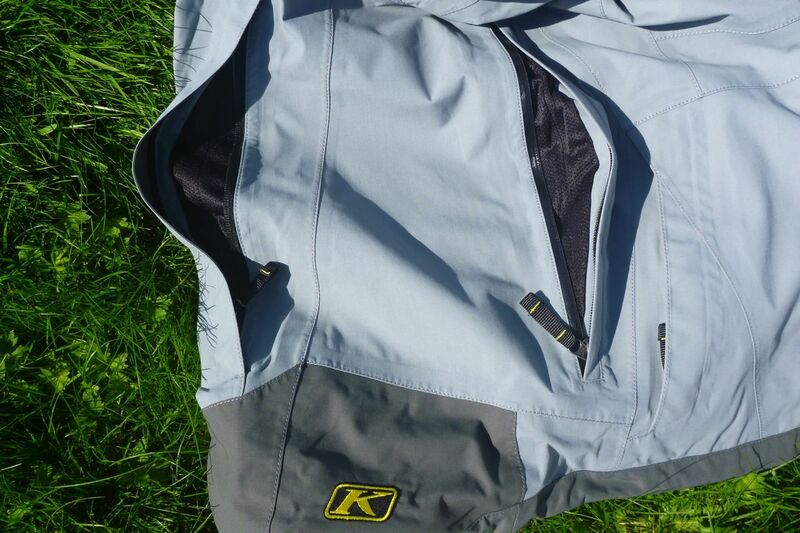 That’s how it looks to me with Klim in the UK and now we have more normally priced jackets like the Traverse, and the second take on the Traverse which is known as the Overland. As I say in the book, setting off on a long trip you’ll be wearing your jacket just about all the time for weeks or months. It’s got to work well, feel right and be up to the task as it’ll become your second skin. 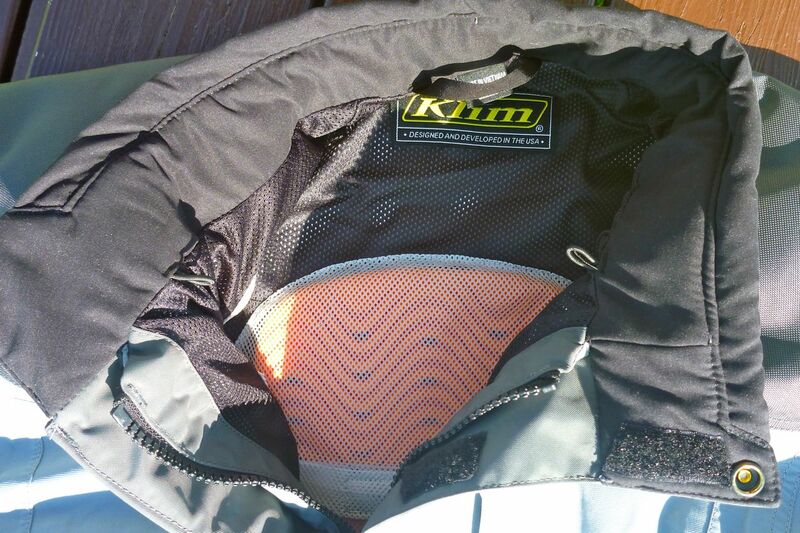 One thing that categorises Klim as a serious contender is they only make rugged waterproof shells and eschew what is to me the cheap measure of a zip-out membrane. 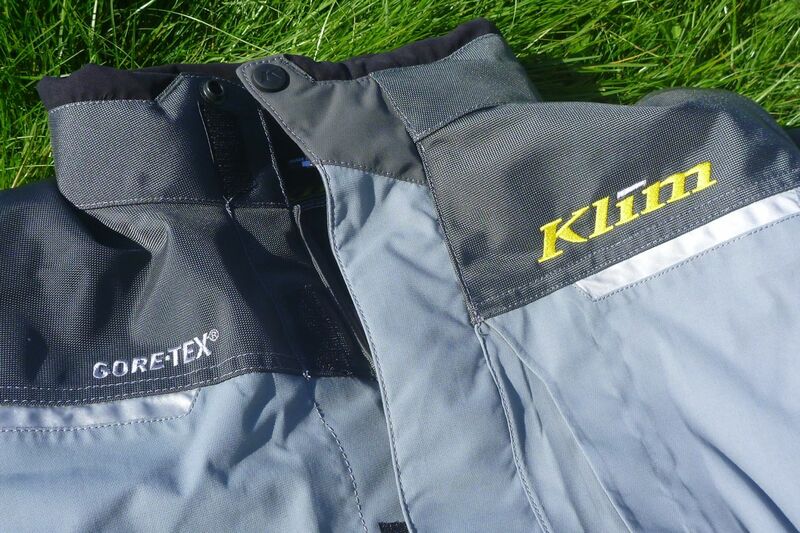 If you want a serious Gore-tex type jacket, get one where it’s laminated to the outer shell. Yes, it costs more. I set off for what turned out to be a 180-mile ride on an October day with temps peaking at 13° and strong winds forecast. Underneath I was wearing the Powerlet, a thick shirt and a vest, and leather trousers plus thin unlined gloves. I planned to fire up the Powerlet when the chill got to me. As it turned out – perhaps because I was stopping a lot – that never happened. The Overland kept me warm all day right up to sunset which was impressive. It means you can wear less clobber underneath but I suppose may get hot working hard off road in a warmer climate. For that reason I chose the grey version rather than the black. It really can make a difference. Doing it up I noticed that with the Powerlet’s high wire-laden collar and a shirt collar too, there wasn’t really room for my thin neck buff I usually wear. The front collar stud was a two hand squeeze to do up and the collar felt tight at the front while loose at the back where the cinch is. In other words the collar fitting was too upright or – like many humans in this digital, screen-staring era – my neck and head stick forward like a round-spined Australopithecus. Trying it again now it definitely presses on my Adam’s apple, but not unbearably so. Normally I prefer loose clothing and the Overland is a ‘snug’ fit round the neck and in the arms and across the shoulders with arms pulled backed which is probably more flattering, cosier and aerodynamic. Riding along I thought I felt a chill under the arms through the vent zips, but not enough to plug in the heated jacket. And anyway this could be attributable to my bike / screen /posture / speed. Later on I didn’t even notice it. 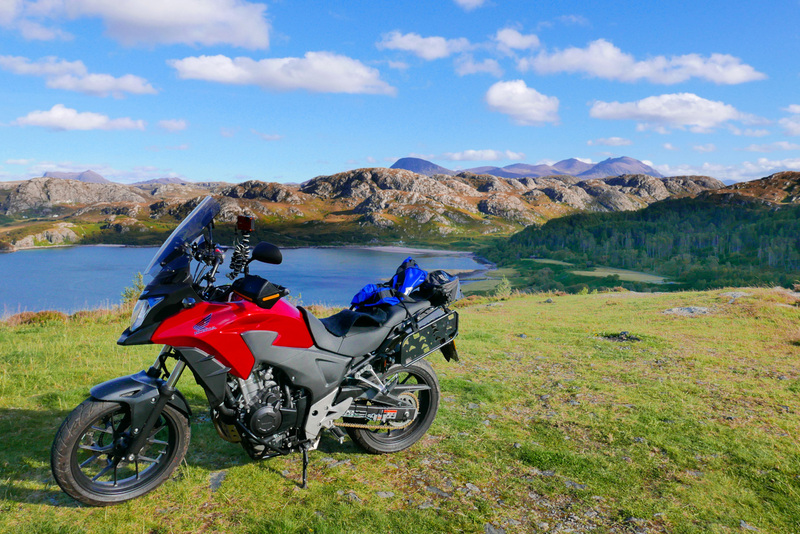 At one point I left the bike perched on a sunlit hillside track and walked on to recce the route. In a black jacket I’d have cooked like a Findus boil-in the-bag cod in parsley sauce, but the Overland was surprisingly cool. By the time I got back to the bike I did have a bit of a glow on, but rode back the few miles to the main road unzipped and flapping by which time normal operating temps had resumed. An hour and lots of lipsmacking pics later I pulled in at a cafe near Poolewe and instinctively went to slot my gloves into a pocket to came up against the Overland’s main flaw: too small pockets. I suppose I could have stuffed then into one of the lower pockets but what I’d like a decent, map-sized chest pocket or some meshy drop pockets low down inside (they could actually be easily tacked on to the mesh. What do other riders do? – cart around a tank bag or backpack – or slip them in a topbox I suppose. A jacket called Overland needs overlandable storage. For the return run I also removed the back armour to free up some room. It made the jacket lighter and more flexible, but I can’t say it felt significantly more roomy. For that the shoulder pads need to come out but I’ll keep those for the moment. Riding back with the sun now dipping behind the hills, I expected to resort to the Powerlet, but riding up to 80mph the Klim still hung in there. 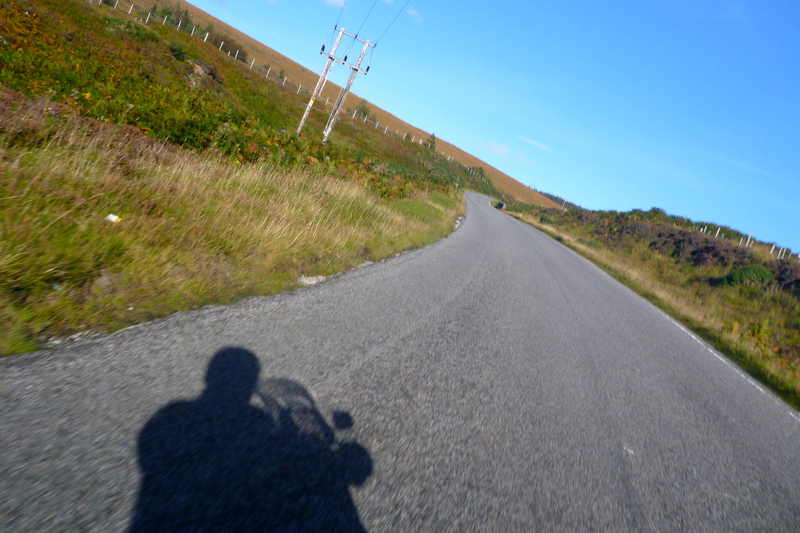 The wind was up now too, pushing me around on the single track roads and at one point coming over a pass I distinctly felt the wind catch the back vent flaps and pull me around in the seat. 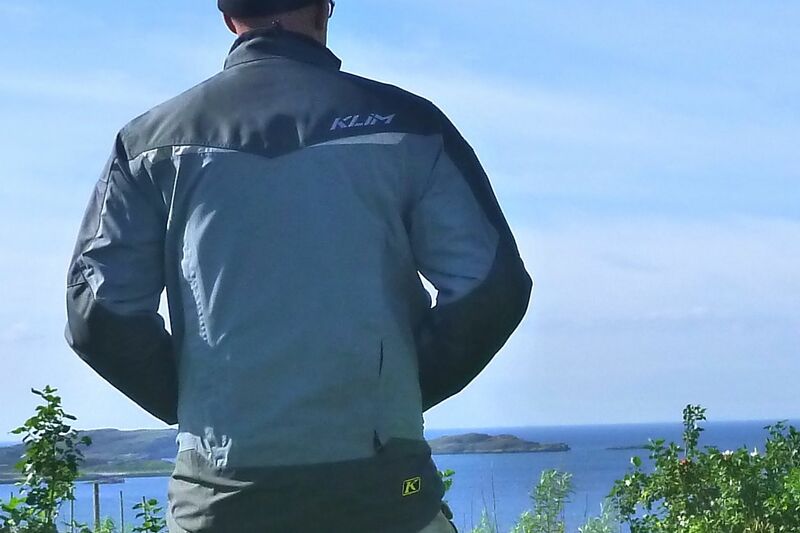 So – preliminary findings on the Klim Overland adventure touring jacket. Warmer than you’d think, under pocketed but the plain looks that are growing on me. Great armour and adjustability too. Resistance to pelting rain and ventability to be established. I always wonder if the latter might compromise the former. 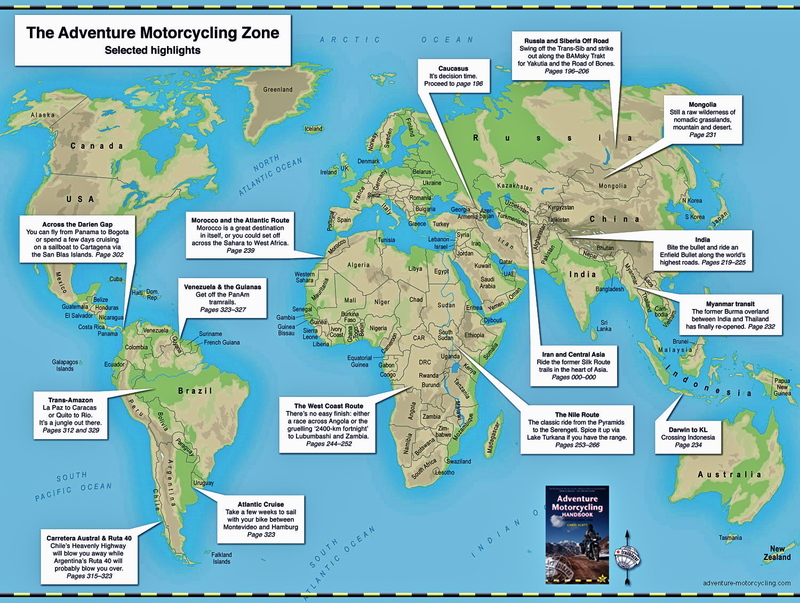 This entry was posted in Adventure Motorcycling Gear Reviews, AMH News, Jackets & Trousers, Project: Honda CB500X Rally Raid and tagged adventure spec, Aerostich Air vantage kanetsu, Aerostich Kanetsu, Klim Overland jacket review, Powerlet Rapidfire heated jacket. Bookmark the permalink.